Are you solid with your resolutions and business goals for the coming year? If not, the problem could be baked into the resolutions themselves. Use the S.M.A.R.T. 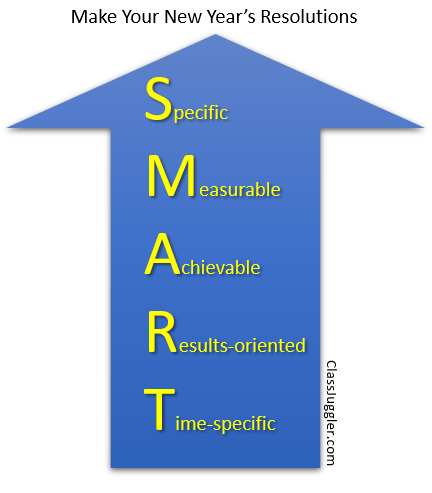 acronym to radically raise the likelihood that you’ll achieve your goals. The S.M.A.R.T. 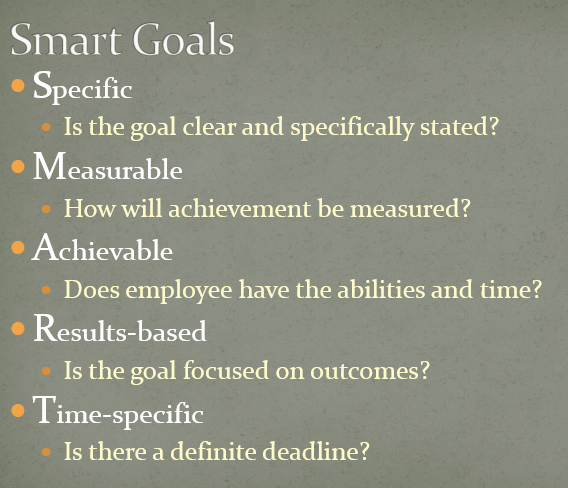 method of planning business goals or individual goals is popular among leading businesses globally, and there’s no reason not to capitalize on this methodology for your own school and life planning. Businesses often use the word COMMITMENTS, rather than RESOLUTIONS, but it’s essentially the same thing commitments or resolutions are what you (as an individual or as a business) will do to achieve certain standards or improvements in your life or work. Each letter of S.M.A.R.T. is the key to planning goals and actions that you’ll actually get done. Here’s how. Define specific results you expect as an outcome for the commitment. Example: “Losing 10 pounds” and “Add at least 50 new students” are specific. “Be uplifting” and “Be a better coach” are not specific. Ensure that your actions can be measured as you progress toward completing your commitment. Can you measure the quantity and/or quality concretely? Example: “Increase attendance rate to 90%” and “Improve customer service feedback scores from Good to Very Good” are measurable; you can measurably check your progress quarterly or monthly to ensure that you’re on target. Create commitments that are challenging, yet achievable. If it’s too lofty – “Grow my revenues fourfold in 2016” – you’ll only get frustrated or unhappy when it becomes evident that it’s not realistic. Measure success on the results you achieve, not just on the steps you take. So, reduce my body fat from 25% to 23% is about results, while “Eat healthfully every day” is not. With each commitment, establish milestones, checkpoints, and a completion date. If you want to add 80 new students by year’s end, then you can set quarterly review sessions to see if you are one quarter of the way – 20 new students – toward meeting that goal. Set no more than 5 to 7 commitments – enough to make a measurable difference by the end of the year, but not so many that the commitments are competing with each other for your time. Make sure your individual work commitments align to your overall business vision and that, likewise, your personal commitments align to your vision of who you want to be. For example, a goal to run your first marathon can be good if it’s what YOU want, but not a good goal if you’re only doing it because your friend wants you to do it with her. Once you’ve set your commitments, also identify how you will achieve your commitments. Plan key milestones – the evidence that you’re executing your plan. Keep in mind that many of the business management tools and features within ClassJuggler’s school management software can help you achieve your business commitments. This entry was posted in Cheer ClassJuggler, ClassJuggler Dance, ClassJuggler Dojo, ClassJuggler Fitness, ClassJuggler for Franchises, ClassJuggler K-12, Music ClassJuggler, School Management Tips, Swim ClassJuggler and tagged business planning, business principles, goal setting, New Year's resolutions on September 19, 2018 by classjuggler.